- Inspired by the same engineering that has powered 13 consecutive victories at 24 Hours of Le Mans. - Optimized through technology of Variable Contact Patch 2.0 and Twaron belt package for long even wear. 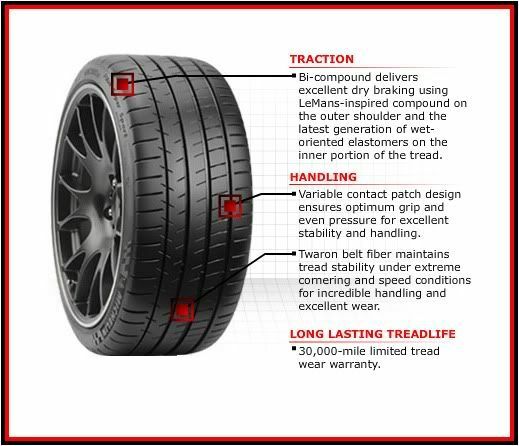 - Bi-compound delivers excellent dry braking using LeMans-inspired compound on the outer shoulder and the latest generation of wet-oriented elastomers on the inner portion of the tread. If you are running the Michelin Pilot Super Sport, post your review here along with a picture or two – we, as well as Michelin, would love to read them. I like the part where it says "Up to 2x longer lasting than leading competitors"
Anyone tried these tires yet?